Climate change is readily observable in the Alps. Mountainous regions and the species that inhabit them are dependent on and defined by climatic conditions that vary along elevation gradients. As a result, changes in climatic parameters have a strong impact on both the physical environment and the living world. Rapid changes in the climate have been recorded on a global scale since the beginning of the industrial era. These developments are characterized by increases in temperatures, changes in precipitation patterns and an increase in the frequency and intensity of extreme climatic events (heat waves, droughts). Since the beginning of the 21st century, new record temperature highs are accumulating, signaling warming on a global scale. - A year to break all records: 2016 not only broke annual temperature records, but 8 of the year’s 12 months were also the hottest on record. 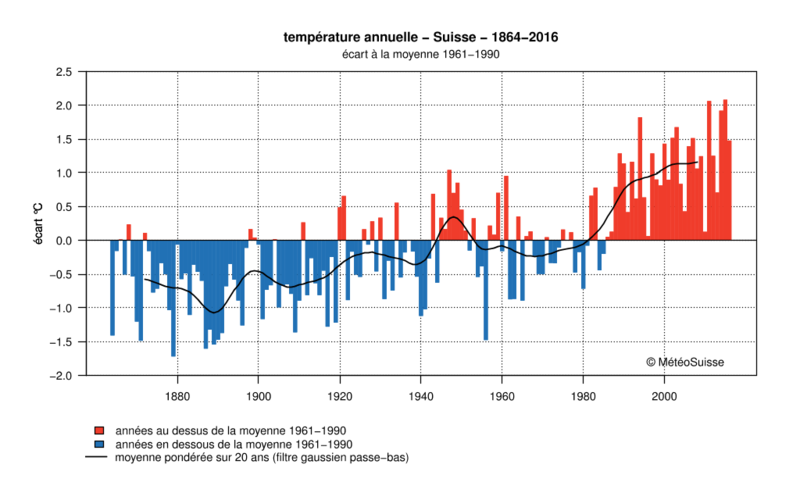 At the scale of the European Alps, over the course of the 20th century, temperatures have risen by 2°C (3.6°F). This rise is greater than the French average of +1.4°C (2.5°F) and double the increase recorded in the northern hemisphere. The rate of this warming, observed since the beginning of the Industrial Revolution, has increased since the 1980s to 0.5°C (0.9°F) per decade. In terms of temperature conditions, 0.5°C represents about a 100 m (328 ft) difference in elevation. That means that, in order for species be able to stay in the same temperature conditions, they would need to move 100 m upslope. Herein lies the challenge for biodiversity: how to keep pace with this rapid evolution in the climate? Warming is amplified in mountain environments because the increase in temperatures leads to a decrease in the size of zones covered with ice and snow which reflect the sun’s rays. These zones are replaced by areas of dark rock and later vegetation, which instead absorb the suns heat, increase ground temperature and contribute to more melting. Although global precipitation patterns have not changed significantly over the course of the 20th century, considerable regional and seasonal changes have been observed. Since 1960, winter precipitation has significantly diminished in the south of France, while an increase has been recorded in the north. In the Alps however, located at the crossroads between the Mediterranean and Atlantic weather systems, the differences are extremely localized. 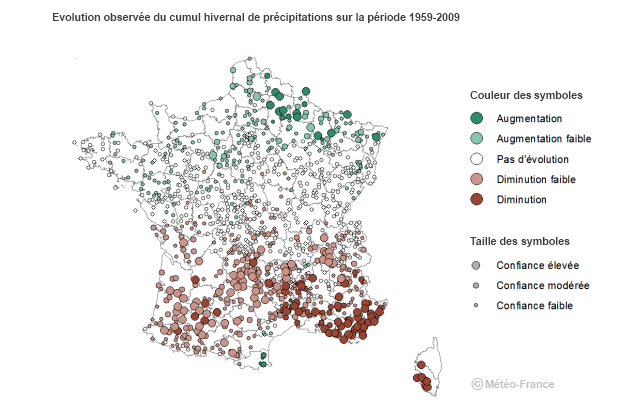 For instance, the reduction in summer precipitation is more noticeable in the southern part of the French Alps. The changes that have already been observed since the beginning of the 20th century will be amplified until at least 2030. Changes experienced thereafter will depend on our ability (or lack thereof) to rapidly decrease our greenhouse gas emissions. Climate models, which are developed based on past observations, allow us to predict how the climate will change in the future and how the changes may impact the environment through 2100. All of the different climate scenarios, which are based on varying levels of greenhouse gas emissions, predict an overall increase in temperatures. In France, that increase is predicted to be between 2 and 5°C (3.6 and 9°F) by 2100, when compared to the beginning of the 21st century (source: MétéoFrance). In the Alps, the middle scenario forecasts a rise in average annual temperatures of 3.3°C (5.9°F) by 2100 compared with the period between 1960 and 1990. Prediction for changes in rain patterns by 2100 show a 20% decrease in rain during the summer months, most noticeably in the southern part of the Alps, as well as a 10% increase in winter precipitation. The growing frequency of extreme weather events and the intensity of droughts could have higher impacts on the biological world than the rise in temperatures or precipitation. By 2100, every other summer could be as hot as it was during the heat wave of 2003. By the end of the century, the northern Alps are expected to see more severe weather events, such as autumn rain storms, with a 30% increase in the intensity of precipitation. Temperature models predict that, in 2100, in order to find conditions equivalent to those now experienced in July (the warmest month of the year), you’ll have to climb an additional 700 vertical meters (2,300ft). For instance, the zero-degree isotherm will shift from its current altitude of 3,380m up to 4,080m by 2100. The consequences of changes in temperature and precipitation are already clearly visible in the mountains: significant glacier retreat, reductions in the snowpack at mid- mountain elevations, more frequent soil water shortages and rises in the altitude at which permafrost is found. One of the most noticeable consequences of climate change in the Alps is the glacier recession. With rising temperatures, mid-altitude glaciers are shrinking at an alarming rate. Since 1850, glaciers in the Alps have lost between 30 and 40% of their surface area and half of their volume, with a further 10 to 20% of their volume having disappeared since 1980. Studies have predicted that 52% of Switzerland’s small glaciers will be gone within the next 25 years. As moraines become exposed following glacier retreat, they are subject to strong colonization pressures by vegetation, adding to the significant landscape changes that can be observed in mountain regions. One of the main characteristics of mountain landscapes is the presence of snow on the ground for relatively long periods of time. Spatial patterns of snow cover duration are tightly linked to topographical features, including altitude, aspect and slope angle. By its very nature, snow has a major effect on local environmental conditions, be it determining potential growing season length, providing insulation from frigid temperatures or generating an important source of water during the spring melt. Increasing winter temperatures cause a rise in the elevation of the “snow line”, or the elevation at which precipitations fall as snow instead of rain. Since 1970, in the Alps, the amount of snow falling at mid-mountain elevations has decreased, causing a shortening of the period during which snow covers the ground. For instance, in the Mont-Blanc massif, the period of snow cover at mid-mountain elevations has decreased by nearly a month since 1970. At higher altitudes (>2,500 m), even though the winter precipitation levels have remained stable over the past decades, higher temperatures in spring and summer have led to faster melting and a shortening of the snow cover period. 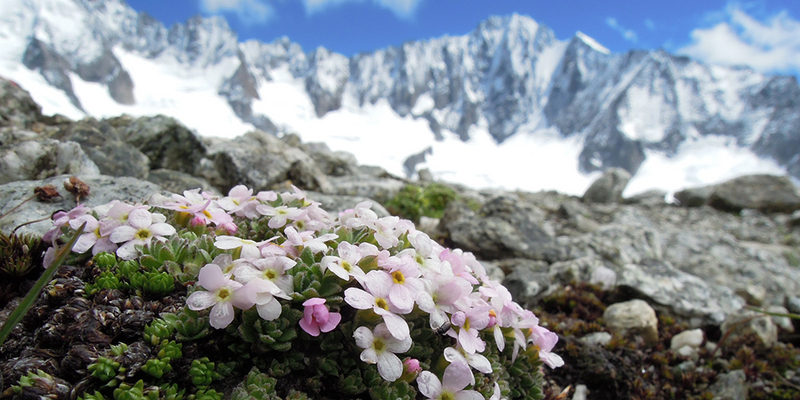 The snow cover period has a significant influence on alpine fauna and flora (see below). 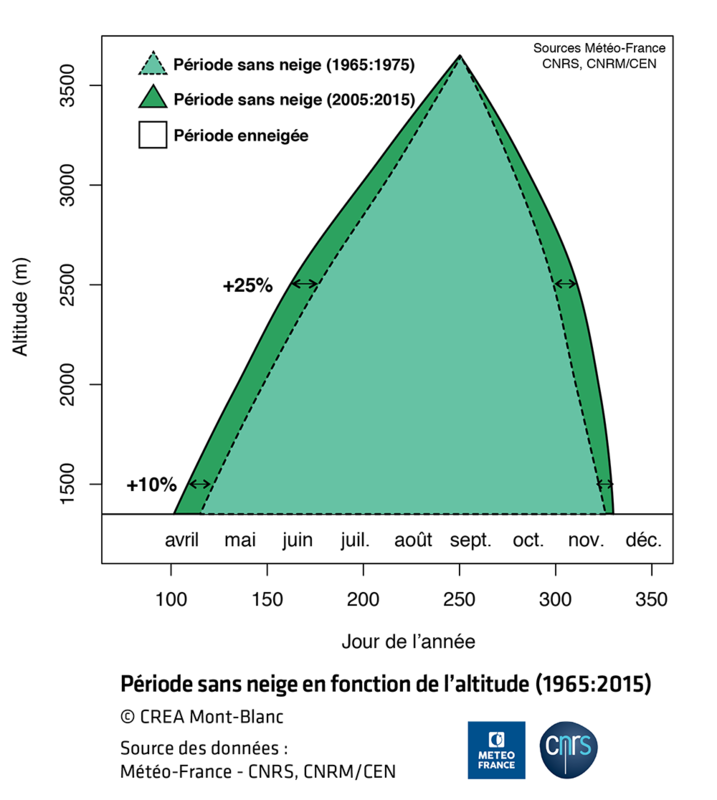 When comparing periods without snow for the years 1964-75 and 2005-2015 in the Mont Blanc massif, there has been an increase of 25 days for altitudes between 1,500 m (4,921 ft) and 2,500 m (8,202 ft). However, proportionally speaking, the most significant changes are found around 2,500 m where the duration of the snow-free period has increased by 25%, compared with 21% at 2,300 m (7,546 ft) and 12% at 1,500m. Permafrost, or permanently frozen ground, covers a large area in the Alps and plays a vital role in maintaining the stability of the terrain in mountain landscapes. In the Mont-Blanc massif, 65% of rock faces above 2,300 m are permanently frozen. With the rise in summer temperatures, the permafrost melts, creating significant instability in rocky terrain. Over the past 20 years, permafrost has disappeared on south-facing rock faces of the Mont-Blanc massif below 3,300 m (10,827 ft). 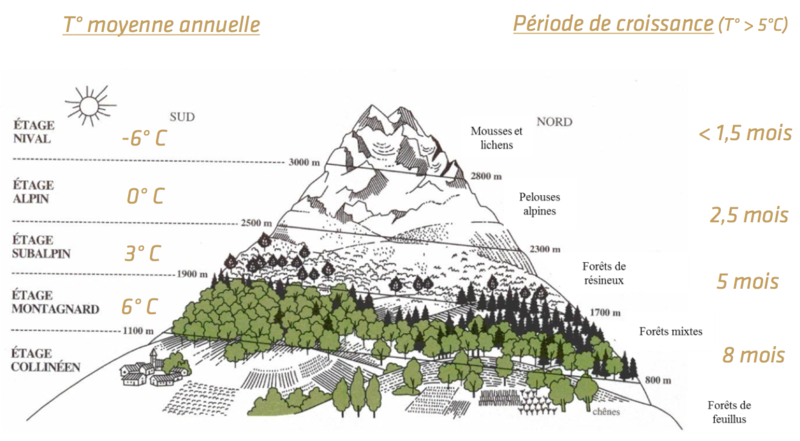 Furthermore, permafrost at temperatures above -2°C can no longer be found below 3,850 m (12,631 ft); and current project that the elevation at which it is present on south faces in the Mont-Blanc Massif may rise up to 4,300 m (14,108 ft) or even disappear completely by 2100. The increase in temperature, coupled with decreases in summer precipitation, has led to droughts in summer and groundwater shortages. This phenomenon is exacerbated by the reduction in snow cover and can cause water shortages for plants and amphibians during their growth stage. The effects of climate change on alpine flora and fauna are noticeable and are already contributing to changes in species distribution and abundance, as well as the timing of seasonal events. Will biodiversity be able to adapt to these rapid climate change-related changes in their environment? Combined with habitat disturbance caused by human activities, climate change is the main challenge faced today by plant and animal species. In order to survive changes in climate, species can either migrate to follow the climatic conditions to which they are best suited, or they can change their physiology or seasonal behavior to adapt to new environmental conditions. We have already noticed, over the past 50 years, a general tendency in which seasonal events have advanced by 2 to 5 days per decade for plants and land-based animals. For instance, the arrival of migrating birds has advanced by approximately 15 days over the past 30 years, and the egg-laying season of the common toad is also starting earlier (approximately one month earlier than 25 years ago at a study site at 1,850m in Switzerland). In terms of vegetation, the rise in spring temperatures, combined with earlier melting of the snow cover allows the majority of species to develop earlier in the season and to produce more biomass over the course of the growing season. For certain species however, this precocity is not necessarily an advantage. For the blueberry, which is very sensitive to frost, beginning productivity earlier can increase the risk of damage to the buds from frost events in late spring. Because different species respond to climate change differently, there is an increasing risk of desynchronization within ecosystems, particularly between trophic levels. For large herbivores such as the Alpine ibex, the date of the birth of kids is not related to spring conditions but rather to the date of mating, which happens in autumn. During years with relatively warm winters and/or springs, peak vegetation production is desynchronized with the weaning of young ibex. As a result, a higher mortality rate of the young ibex has been observed in the Grand Paradiso National Park in years when spring has come early. Once a species is present in a given location, its ability to grow and reproduce on optimal climatic conditions for its development, on physical aspects of the terrain (presence of soil, the snow cover period, the sunshine duration, etc.) and also on interactions with other species in the ecosystem (predator-prey dynamics, competition, facilitation). Each species has its needs. Over the past few decades, with the warming of the climate, a rise in elevation of most animal species has been observed, ranging between 30m (98ft) to 100m (328ft) per decade. 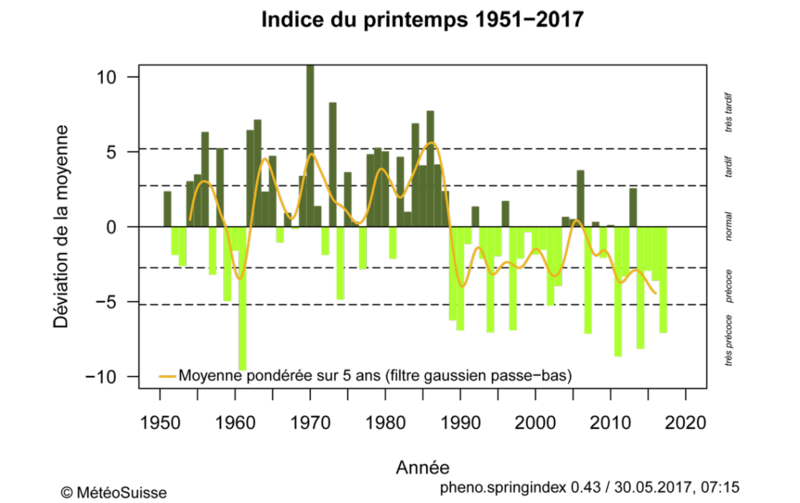 As for forest plants throughout the Alps, this rise has been on the order of approximately 30m over the 20th century. Combining the results of multiple studies across various European mountain ranges, there seems to be a trend towards an increase in the number of plant species found on summits during recent decades. In general terms, those species adapted to warmer conditions and coming from lower elevations will tend to move upward in elevation, competing against alpine species, which are better adapted to colder conditions but are not as competitive. Given the pyramidal shape of mountains, gaining elevation naturally implies a loss of available area. The glacier buttercup (*Ranunculus glacialis*) which is specifically adapted for growing in high mountain environments will have to climb 1,200m (3,937ft) by 2100 to find favorable climatic conditions. Overall, this will means a loss of 70% of available land and thus a rarefication of species adapted to extreme conditions. Nonetheless, melting glaciers and snowfields may offset some of this loss by opening up new areas to colonization. Habitat loss can also be buffered by the topographic complexity of mountainous terrain and the presence of numerous cold micro-habitats. While annual climatic variations strongly affect vegetation productivity, the long-term changes in climate patterns result in gradual changes of the structure of vegetation (taller plants, higher biomass or more significant photosynthetic activity). These processes contribute to a “greening” of the Alps with increased vegetation cover, even at higher elevations. In animals, especially those that do not regulate their body temperature (insects, amphibians, and reptiles), temperature variations have a direct impact on their physiology. 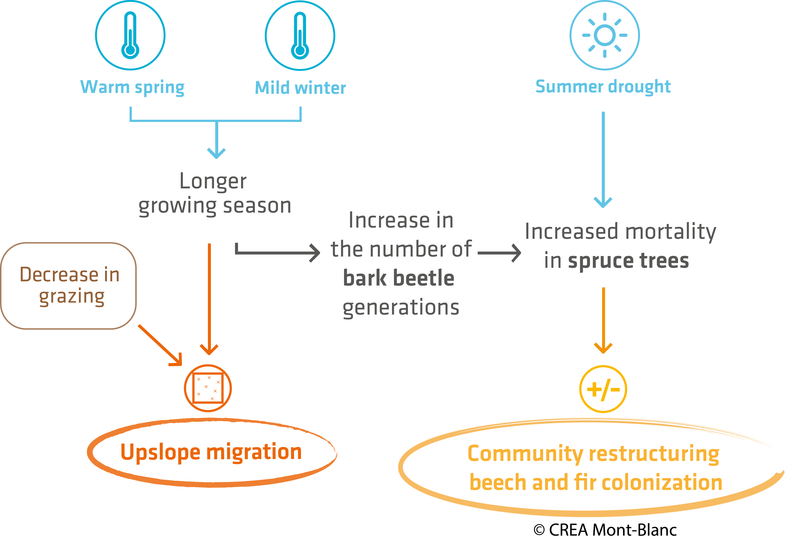 For example, the bark beetle, a parasitic insect that preys on spruce trees, is directly influenced by the rise in temperatures which allow it to begin its activity earlier in spring. This allows it to increase the number of generations produced in a single year and thus increase the pressure on its host, the spruce, which is already weakened by frequent summer droughts. Carlson B Z, Corona M C, Dentant C, Bonet R, Thuiller W, & Choler P. 2017. 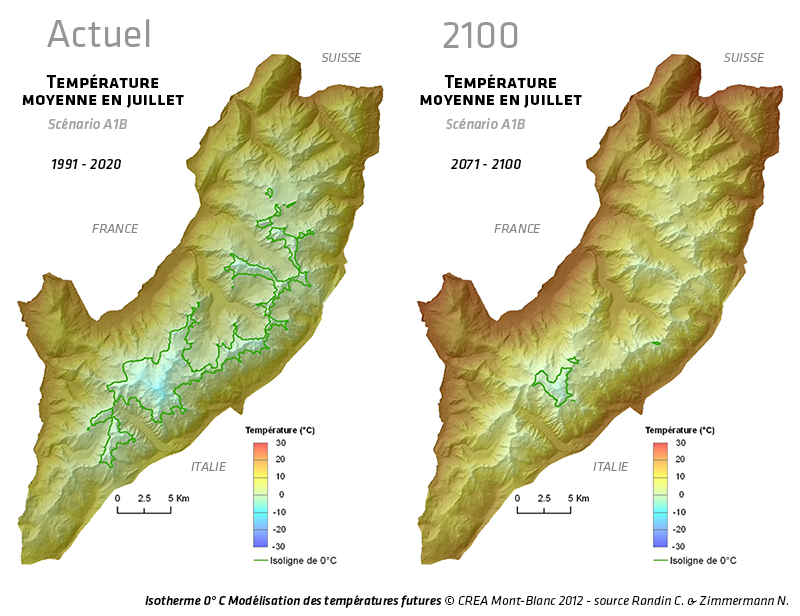 Observed long-term greening of alpine vegetation–a case study in the French Alps. Environmental Research Letters. Choler P. 2015. Growth response of temperate mountain grassland to inter-annual variations in snow cover durations. Biogeosciences, 12(12). Durand, Y., Laternser, M., Giraud, G., Etchevers, P., Lesaffre, L., et Mérindol, L.: Reanalysis of 44 yr of climate in the French Alps (1958–2002): methodology, model validation, climatology, and trends for air temperature and precipitation, J. Appl. Meteorol. Clim., 48, 29–449, 2009. Gobiet A, Kotlarski S, Beniston M, Heinrich G, Rajczak J, Stoffel M. 2014. 21st century climate change in the European Alps – A review. Science of the total environment 493. Huss M, Fischer M. 2016. Frontiers of Earth Science 4. Magnin F, Josnin J-Y, Ravanel L, Pergaud J, Pohl B, Deline P. 2017. Modelling rock wall permafrost degradation in the Mont Blanc massif from the LIA to the end of the 21st century. The cryosphere 11. Pettorelli N, Pelletier F, Von Hardenberg A, Festa-Bianchet M & Côté S D. 2007. Early onset of vegetation growth vs. Rapid green-up : impacts on juveniles mountain ungulates. Ecology 88. Rabatel A, Letréguilly A, Dedieu J-P & Eckert N. 2013. Changes in glacier equilibrium-line altitude in the western Alps from 1984 to 2010: evaluation by remote sensing and modeling of the morpho-topographic and climate controls. The Cryosphere 7(5). Vionnet, V., Brun, E., Morin, S., Boone, A., Faroux, S., Le Moigne, P., Martin, E., and Willemet, J.-M. : The detailed snowpack scheme Crocus and its implementation in SURFEX v7.2, Geosci. Model Dev., 5, 773-791, doi :10.5194/gmd-5-773-2012, 2012. Vitasse Y, Schneider L, Rixen C., Christen D, Rebetez M. 2018. Increase in the risk of exposure of forest and fruit trees to spring frosts at higher elevations in Switzerland over the last four decades. Agricultural and Forest Meteorology 248. Vittoz et al. 2011. 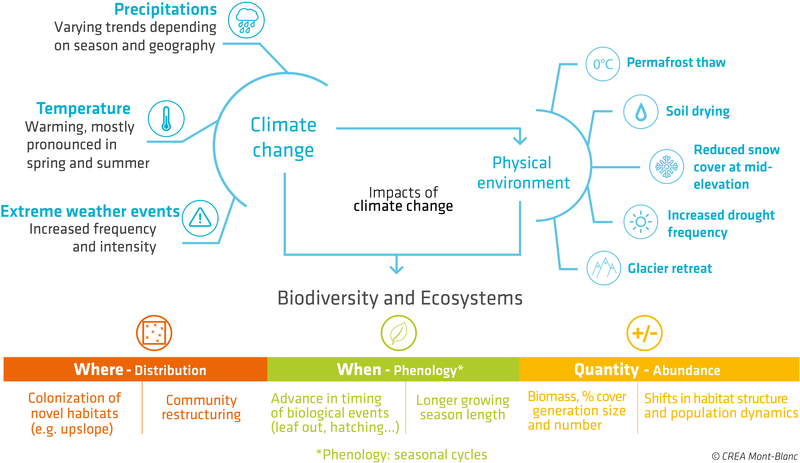 Climate change impacts on biodiversity in Switzerland: A review. Journal of Nature Conservation 21. Yoccoz N.G., Delestrade A. & Loison A. (2010). Impact of climatic change on alpine ecosystem: inference and prediction. Revue de Géographie Alpine 98.